Fig. 5. Origin of the cardiac neural crest within a 34-h chick embryo. Green dots represent cardiac neural crest cells in the neural folds of hindbrain rhombomeres 6-8 (the region of the first three somites up to the midotic placode level). Fb, forebrain; Mb, midbrain. fuse with the atrioventricular cushions, which also divide the left and right atrioventricular canals and serve as the source of cells for the atrioventricular valves. Prior to septation, the right atrioventricular canal and right ventricle expand to the right, causing a realignment of the atria and ventricles so that they are directly over each other. This allows venous blood entering from the sinus venosus to flow directly from the right atrium to the presumptive right ventricle without flowing through the presumptive left atrium and ventricle (8,14). The new alignment also simultaneously provides the left ventricle with a direct outflow path to the truncus arteriosus and subsequently to the aorta. Fig. 6. Transition from fetal dependence on the placenta for oxygenated blood to self-oxygenation via the lungs. (A) Circulation in the fetal heart before birth. Pink arrows show right-to-left shunting of placentally oxygenated blood through the foramen ovale and ostium secundum. (B) Circulation in the infant heart after birth. The first breath of the infant and cessation of blood flow from the placenta cause final septation of the heart chambers (closure of the foramen ovale and ostium secundum) and thus separation of the pulmonary and systemic circulatory systems. 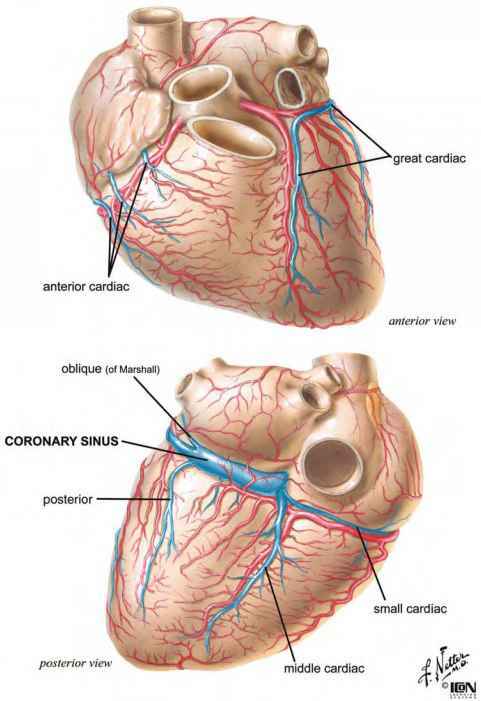 Blue arrows show the pulmonary circulation, and the red arrows show the systemic circulation within the heart. AV, atrioventricular; LA, left atrium; LV, left ventricle; RA, right atrium; RV, right ventricle. the use of the pulmonary system is not necessary, but eventually a complete separation of the systemic and pulmonary circulatory systems will be necessary for normal cardiac and systemic function (8). Initially, the right sinus horn is incorporated into the right posterior wall of the primitive atrium, and the trunk of the pulmonary venous system is incorporated into the posterior wall of the left atrium via a process called intussusception. At day 26 of human development, a crescent-shaped wedge of tissue, called the septum primum, begins to extend into the atrium from the mesenchyme of the dorsal mesocardium. As it grows, it diminishes the ostium primum, a foramen that allows shunting of blood from the right to the left atrium. However, programmed cell death near the superior edge of the septum primum creates a new foramen, the ostium secundum, which continues the right-to-left shunting of oxygenated blood. An incomplete, ridged septum secundum with a foramen ovale near the floor of the right atrium forms next to the septum primum; both fuse with the septum intermedium of the atrioventricular cushions (8). At the same time as atrial septation is beginning, at about the end of the fourth week of human development, the muscular ventricular septum begins to grow toward the septum intermedium (created by the fusion of the atrioventricular cushions), creating a partial ventricular septum. By the end of the ninth week of human development, the outflow tract septum has grown down onto the upper ridge of this muscular ventricular septum and onto the inferior endocardial cushion, which completely separates the right and left ventricular chambers. Not until after birth, however, does the heart become functionally septated in the atrial region. At birth, dramatic changes in the circulatory system occur because of the transition from fetal dependence on the placenta for oxygenated blood to self-oxygenation via the lungs. During fetal life, only small amounts of blood are flowing through the pulmonary system because the fluid-filled lungs create high resistance, resulting in low-pressure and low-volume flow into the left atrium from the pulmonary veins. This allows the high-volume blood flow coming from the placenta to pass through the inferior vena cava into the right atrium, where it is then directed across the foramen ovale into the left atrium. The oxygenated blood then flows into the left ventricle and directly out to the body via the aorta. At birth, the umbilical blood flow is interrupted, stopping the high-volume flow from the placenta. In addition, the alveoli and pulmonary vessels open when the infant takes its first breath, dropping the resistance in the lungs and allowing more flow into the left atrium from the lungs. 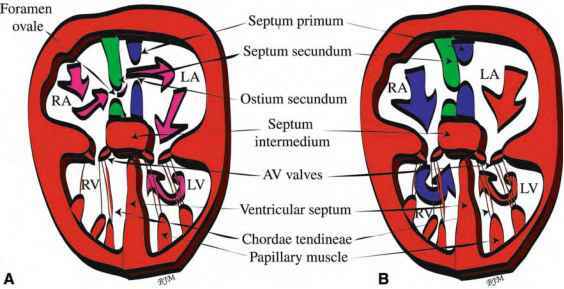 This reverse in pressure difference between the atria pushes the flexible septum primum against the ridged septum secundum and closes the foramen ovale and ostium secundum, resulting in the complete septation of the heart chambers (Fig. 6) (8).